P.M. Skincare: Get the Skin of Your Dreams. — ecobabe. I know you’ve heard me say this a million times, but…. Beauty sleep is a real thing. It’s proven that your skin starts to wind down between 9 - 11 pm, just like your body does. By the time your head hits that pillow, your skin switches into major recovery mode. At night, your body is calm + there are no environmental factors (like UV rays + pollution) to fight. So your skin utilizes this time to recover, renew + regenerate. It’s proven that when the sun goes down, with the help of nighttime hormones melatonin + HGH, your skin regenerates about 3 times faster than it does during the day. Also, I never hear this discussed much, but it’s v. important: Your skin’s temperature is warmer at night, meaning it’s more permeable + therefore, more receptive to products (as opposed to applying products during the day). But these warmer skin temps also mean moisture loss. Your skin loses a lot of water at night. So. How do you get the perfect P.M. skincare routine that repairs A.M. damage, maximizes renewal + simultaneously hydrates hydrates hydrates? Well, the key is to detox + clean first, then apply products that will aid your skin in that repair/renewal process. Retinol is key here. So are peptides + vitamin C. And then for hydration, you want hyaluronic acid + plant based oils. Sounds like a lot huh? Like, we’re exhausted by the time we crawl into bed… how are we supposed to then implement a 17 step skincare routine!!!! But don’t worry, I’ve got you. I’m exactly the same way. I need simple products that include + correctly combine all of those ingredients for me, so the whole routine is streamlined to just a few steps. And in the morning, I need to wake up with clean, healthy glowing skin. We don’t ask for much LOL! So here is where I introduce you to my fave clean skincare brand, Luzern. Luzern is a Swiss skincare company. It’s luxurious. It’s certified organic. It’s not tested on animals. It’s toxic 12 free. And it works. When it comes to ingredients lists, Luzern is hands down 100% the skincare company I trust + love. 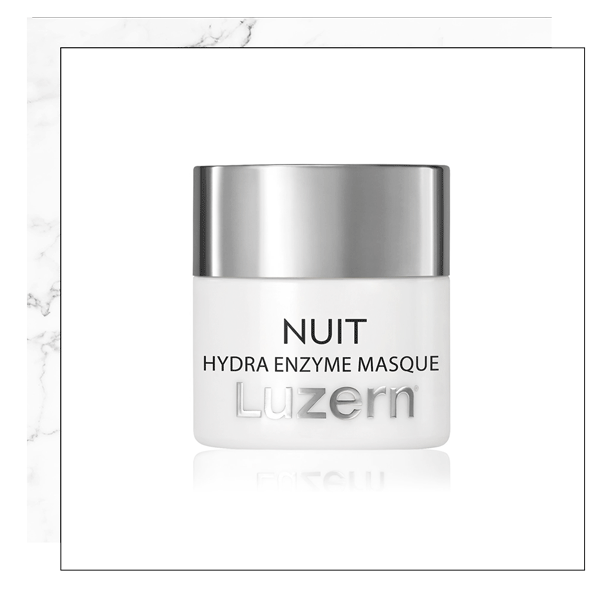 And when it comes to this magical nighttime routine we need, Luzern has figured it out for us. OK you know how everyone is obsessed with cleansing BALMS? Well this is because they’re super efficient in removing makeup + environmental pollution, they’re mess free + they’re LUXE. You apply the balm directly to your dry face + neck. After massaging it into your skin with a bit of water, you remove it with a hot washcloth. The washcloth gently exfoliates your skin + eliminates getting water everywhere. It also ensures that you’ll cleanse your neck at night because it’s seriously SO mush easier this way. This whole process also gives you that deep clean, spa feeling. Oh, + this balm is the HEALTHY alternative to all those cult favorites. It also smells like sweet almond. 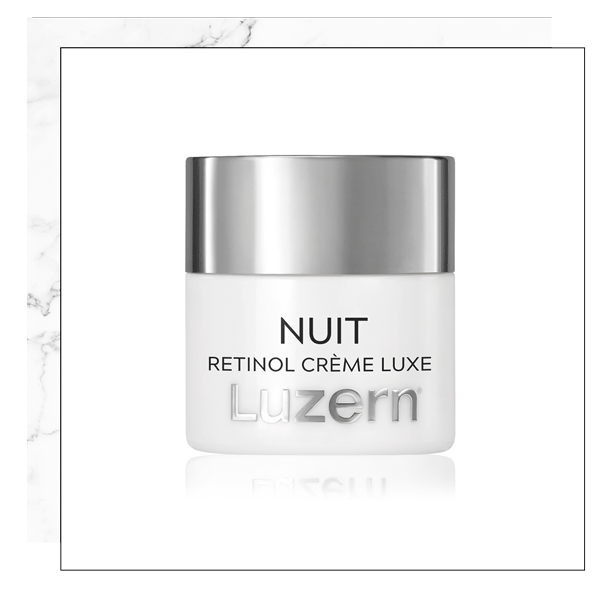 This retinol creme also includes peptides + hyaluronic acid. So you’re done with ALL of that (renewal + hydration) in just one step. Tadah! Your eye cream + face cream should be separate, ALWAYS. The skin around your eyes is the most delicate on your whole body, so it requires different ingredients + consistencies. And this eye masque even includes an eye wand to depuff your skin as you apply it. I love any mask that you can leave on overnight. It’s just one extra step that you can skip (instead of washing it off). And why rinse away all those yummy skin nutrients? Anyway, this mask does all of that, with the added benefits of vitamin C + those oils we referred to above. It’s ideal to use this mask 2-3 times a week, in place of the Retinol Creme. And there you have it. Your perfect nighttime skincare routine that’s both easy + effective. It takes care of that long laundry list of everything your skin needs at night, without much extra effort on your part. ✖️ If you’re over the age of 30, you NEED to be safely incorporating retinol into your skincare routine. It’s one of the best things you can do for anti-aging. So this routine is awesome for us 80’s (+ earlier) babies. ✖️ Your skin is most able to absorb treatments between those hours of 9 - 11 pm. So try to apply these products during that wind-down time. ✖️ Luzern is luxe. It is expensive. However, they’ve just come out with a MINIS line. And luckily, this whole routine is available in those MINI sizes. By starting out this way, you’re able to try the routine FIRST, without breaking the bank + before committing to the full size tubs. I really hope you find this post beneficial babes! Skin is actually very simple, as long as you know exactly what it needs. It helps knowing WHY your skin works the way it does, kind of like knowing the math before the calculator. So please let me know if you have any questions + DEF let me know if you try this routine! !